DURHAM, N.C. (WTVD) -- A new report made public Thursday is shedding more light on an officer-involved shooting in Durham that left a 30-year-old man dead over the weekend. Ondrae Levado Hutchinson was shot by police Saturday at a home on Bevel Court. He later died at the hospital. The officers involved in the incident were identified as Officer R.E. Jimenez, Officer J.W. Lanier, Officer E.I. Masnik and Officer B.L. Mouzon. It all started around 5 a.m. when a woman called police, saying the father of her child was damaging property and scaring her. According to the report, the man was heard screaming in the background before the call abruptly ended. Officers arrived approximately 13 minutes after the call was placed and immediately encountered Hutchinson. Police said they tried to talk to him as he "yelled and ranted while walking around the street and into the driveway." Shortly after one of the officers went into the garage to speak with the caller, Hutchinson entered the garage. According to the report, officers told him to step back outside "in an attempt to create a safe distance between the caller and Hutchinson." Police said he refused commands and was aggressive. As they tried to put him in handcuffs, a struggle ensued and the officers called for back-up. At one point, according to the report, Hutchinson "grabbed on to Officer Lanier's gun with both of his hands." The report states that arriving officers shouted repeatedly for him to let go of the gun but he continued "to hold and attempt to gain control of the officer's weapon with one hand and, using the fist of his other hand, punched Officer Lanier across the face." At that point, Officer Masnik used his Taser on Hutchinson, but it was ineffective, according to the report. Officers repeated their commands to let go but when Hutchinson refused, the report states, Officer Jimenez shot him. Police began emergency medical treatment until EMS arrived on scene. Hutchinson was transported to Duke University Medical Center where he was pronounced dead. 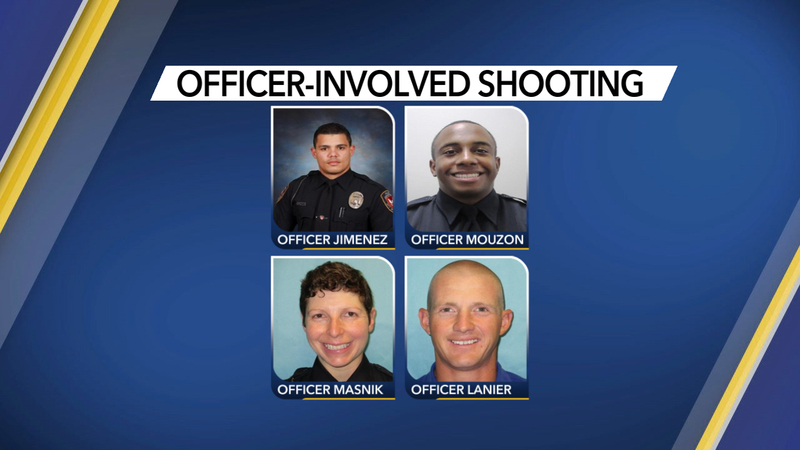 The four officers are on administrative leave with pay, which is standard procedure in an officer-involved shooting.